"All our collectors love Steiff elephants"
Uli is the Designer's Choice Little Elephant for 2016 designed by Ulrike Schrem who has been a Steiff Designer since 1996. It is an elephant which is so admired by all our Steiff Collectors - as Margarete Steiff created a little elephant in 1880 and since then all the Steiff teddy bears and animals have come to us. The elephant is made from a special coat which is made from unique grey fleece material with spots and splashes of colour - so no two bears are exactly the same. He has black eyes, a bright red two tone saddle and is sitting on a matching piece of two tone wool felt. Jackson Pollack was an influential American painter and a major figure in abstract movement. He was well known for his unique style drip painting. Steiff have tried to envisage how Jackson Pollock skilfully splashed colour on the canvas that lay on the floor. A delighted Steiff elephant and world famous artist brought together. Delivery for this item is due October 2016. 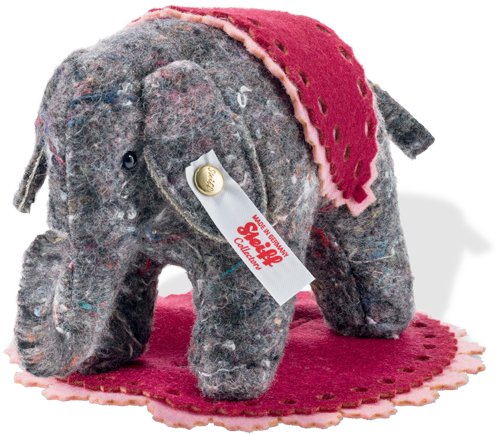 PLEASE PLACE YOUR ORDER NOW TO BE SURE TO GET YOUR STEIFF DESIGNER ULI ELEPHANT - OR CALL US ON 0208 457 7555.